The Wine Advocate - The NV Demi-Sec Exquise is the same base blend as the Initiale but with a higher dosage of 24 grams per liter. This is an exotic, spiced wine with plenty of ripe peach and roasted nut aromas and flavors made in a style meant to emphasize freshness. The finish is long, clean and refreshing. 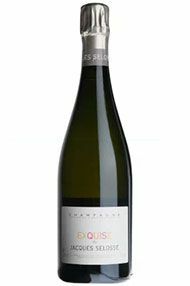 The Exquise would make a terrific match to seared foie gras and fruit-based desserts. Anticipated maturity: 2008-2010.